It smells like a MacBook, it looks like a MacBook, but it’s not a MacBook. The Huawei MateBook X is a team that is developed in the image and likeness of the Apple team, but it differs from it in two very important things. The first, which is based on Windows, something that makes us have an obvious alternative if we like that ultra-thin and ultra-light format. The second, even more important, is that this is like a MacBook except for the other thing: it’s pretty much done better. Until a long time ago to think that a team with these physical characteristics counted on benefits like these would be unthinkable, but here we have one of the maximum representatives of that generation surprisingly complete and at least in terms of “internal power” has nothing than to envy other competitors of greater volume. There are not many glitches to put to the team regarding that sheet of characteristics except in the matter of connectivity, but to ask to suggest two improvements. The first, the possibility of opting for a model with 16 GB of RAM, an amount of memory increasingly demanded among users especially demanding. The second is the use of the Thunderbolt 3 interface on one of these USB-C ports. Since we are again doomed without Micro SD slot or conventional USB ports, here Huawei could at least have reinforced its future bet with an increasingly versatile standard. In that configuration hardware stands out first the processor, which is all an Intel Core i5-7200U. Usually we do not find this type of microcomputers in ultracompact designs, but the energy efficiency of the new Kaby Lake has made us finally have a much more remarkable performance in this type of equipment. In fact one of the most striking features of the equipment is that there are no fans present. The fanless magic makes us find ourselves in front of a totally silent team that also keeps temperatures under control at all times. A special cooling system that its officials call “phase change” is responsible for that management which is difficult to find technical details, although there are studies that can help us to go deeper into the issue. The idea is the ability of that material to melt and solidify at certain temperatures, which helps dissipate heat and cool the system when needed. This system is supported by another equally consistent one that we have already seen in other equipment: when the software detects temperatures that are somewhat higher than recommended, the capacities of the main processor are “shortened”, reducing its working frequency so that there are no overheating problems. In our tests, of course, the team has met expectations. Except during the charging process, in which both the bottom and the part close to the screen was heated, temperatures were low in the rest of the use scenarios, even with a high working load. All this only confirms this trend that makes ultra-thin equipment offer us more and more benefits without having to resort to active cooling that among other things generates annoying snorts at times. We have already seen how some convertible tablets denude generation do, and this MateBook X also confirms that capacity that of course is welcome in this segment. The identity of the new Huawei MateBook X is precisely its ultra-thin and ultralight format. We are facing a team with a 13-inch screen that strangely adopts a 3:2 screen format and does so with another interesting section: his prodigious thinness. 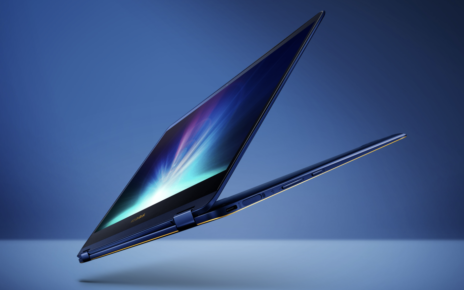 The 12,5 mm of thickness make that we are before a laptop that surprises by its profile but also by its weight, that barely exceeds the kilogram (1050 g). These two dimensions mean that we are facing a team that clearly is oriented to those who have as a priority the design and size of the equipment. In Huawei they offer three different colors for the equipment: gray, gold and golden rose. The latter has been the one that Huawei has given us for testing, and although it is not the color that I would choose for this team if I were to buy it, it is clear that the option draws attention to a certain niche of users. 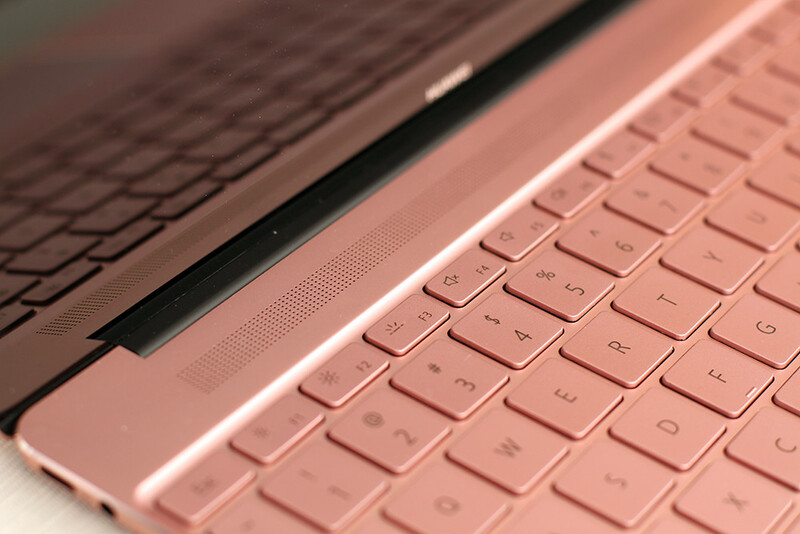 This color covers everything, both on the laptop cover and the keyboard and bottom, which have a completely uniform color and no areas that play with other tones. The screen has very small frames, which in fact go slightly further than the already outstanding Dell XPS 13 with its Infinity Display. In fact here we are a great success in maintaining a wider frame but that is vital to be able to place in that part the webcam (something poor, that is, even if we save in the video conferences) of the computer. That 3:2 screen format is starting to become popular especially on tablets, but we had not seen too many pure notebooks that went to this type of diagonal. Although I personally believe that productivity and enjoyment increase in 16:9 equipment when it comes to working with two windows or when enjoying videos, it is true that this type of screen ratio can be very attractive to work with maximized applications. In this design also highlight the connection ports: on the left side we have the USB-C with USB 3.1 Gen 1 interface that doubles as a charging port, next to which we find the headphone port. On the other side we have the other USB-C port, which unfortunately does not serve as a charging port. Both the keyboard and the touchpad are very well resolved. We especially liked the keyboard, with a fantastic track and feel even with such a small profile and leaving little room for maneuver to Huawei engineers. The touchpad has more than acceptable dimensions, and although everything in general is somewhat “tight” due to the dimensions of the equipment, both the size of the keys and the touchpad was remarkable. In our case the computer came with American keyboard, but that did not pose any problem after setting the keyboard map in Windows 10. On top of this keyboard we find a ventilation grid to the right of which is another of the protagonists of this design: the power button, which doubles its function to become also a surprisingly effective fingerprint sensor. The design of Huawei’s MateBook X is reprehensible for the same reasons that in the past we have condemned similar ultra-thin designs. 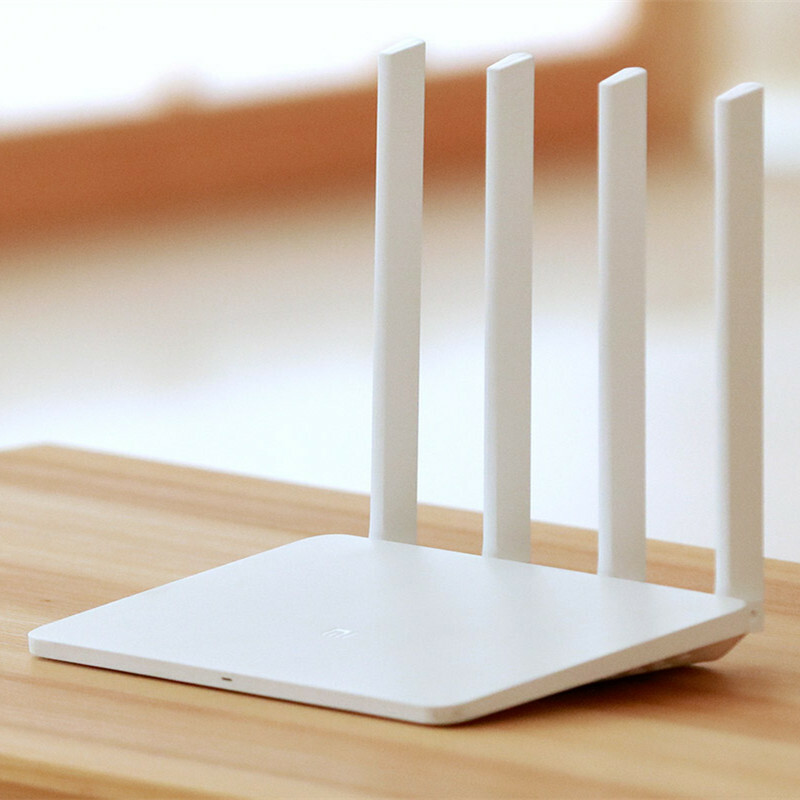 Manufacturers know what they are exposed to with this type of equipment, and users are limited by a supply of really poor connection ports. This computer seems also inspired by the Apple MacBook up to that, but at least it integrates two USB-C ports instead of one. It’s a shame that only one of them can be used as a load port, but the real shame is that no additional ports have been integrated or that those USB-C ports do not integrate a Thunderbolt 3 interface that would give even more play. Of course we miss a traditional USB port, but also an SD card reader or at least Micro SD. 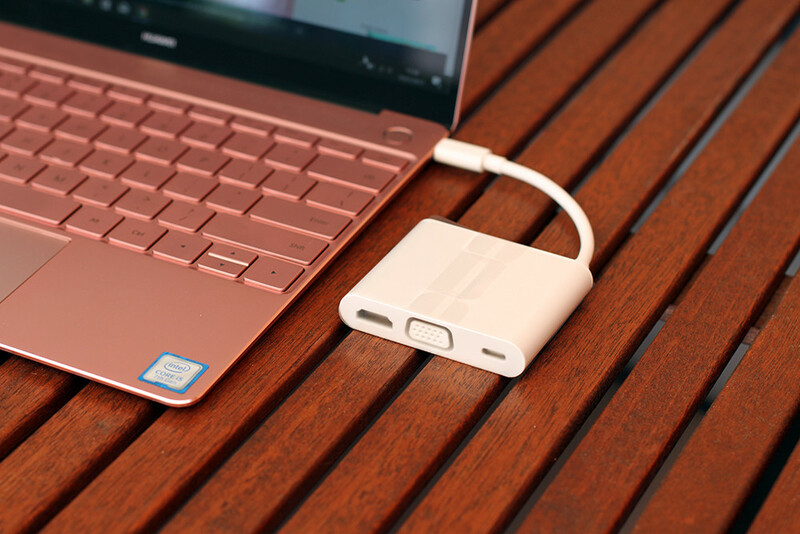 To try to soften the blow, yes, in Huawei include a small dongle that connects to the USB-C port and which includes a USB 3.0 port, another USB-C, a VGA port (yes, VGA) and another HDMI. This accessory therefore allows to solve part of the problem and certainly increases the connectivity options, even if we had already advocated replacing the VGA port with a DisplayPort or Mini DisplayPort, and perhaps, giving everything, an RJ-45 port for Ethernet connections. There has not been so much luck, but of course the gesture of Huawei is remarkable. It was easy to predict that with this hardware configuration the behavior of this “little boy” was surprising. The latest developments in the Kaby Lake processor families mean that micros for this type of equipment do not have to be super-cropped editions of desktop CPUs. In fact that Core i5-7200U is in the same line that we had already seen with the Samsung Galaxy Book a few weeks ago, as they share that same processor. The performance of both is very similar, and it is interesting to compare both with the new Surface Pro from Microsoft. These tests demonstrate excellent performance in both general purpose (PCMark) and video game tasks. It is true that as usual with an integrated GPU like the Intel HD Graphics 620 we will not be able to aspire to a pure gaming experience, but of course you can meet our needs in occasional sessions and with titles that are modestly visually demanding. That good performance was confirmed with the results of the CrystalDiskMark test, which have also been fantastic: the SSD integrated in this equipment achieved sequential read and write rates of 1,281 and 625 MB / s respectively, above a good number of competitors. Another of our usual in the framework of the synthetic tests is Geekbench 4, and it was also demonstrated the good behavior of this processor, which obtained 3531 points in the Single-Core test and 7236 points in the Multi-Core. Few but you can put to the experience of working with this ultraportable Huawei, which as they anticipate the tests manages to offer an exceptional performance that is even more if we consider its thickness. The sensations transmitted by the MateBook X are excellent from the first moment. The screen has a resolution 1440p more than enough (we use it with a scaling of 150%), but it is that in this component Huawei has hit with the bright screen design (beware the exterior reflections, yes) and with its color treatment. We have before us a faithful but ‘happy’ representation of the different tonalities. There is no oversaturation, but the contrast and brightness are very well pre-defined and the experience when working and enjoying multimedia content is excellent. Here, attention, a note prominent in this maremágnum of convertibles that surrounds us: the screen is not tactile and it is not faded either. We are facing a pure laptop that wants to be just that, for good, and for bad. Anyone looking for that option to interact with touch gestures (or with a stylus now that Microsoft is promoting its Windows Ink technology) on the screen may be disappointed, but if that feature does not catch your eye, here is a great candidate to serve you as a companion of fatigues. You have to stop right at that point of multimedia entertainment. 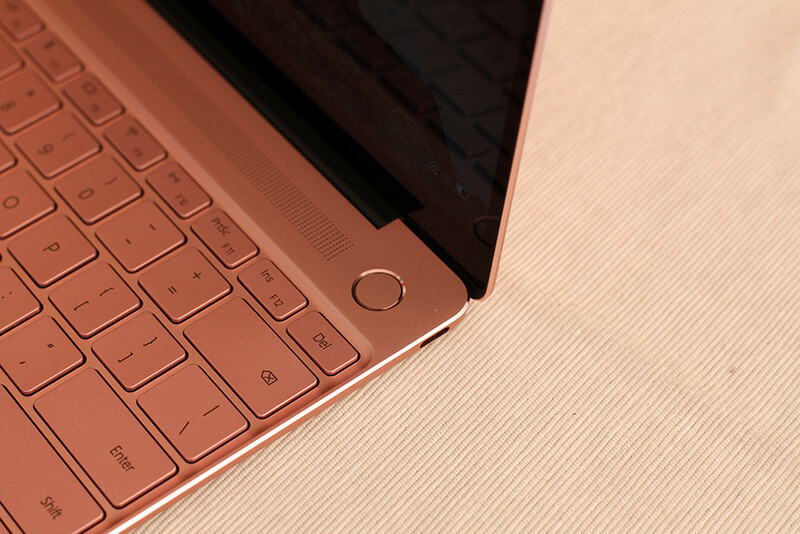 The speakers with Dolby technology that the Matebook X hides under that small grid above the keyboard have been one of the most important surprises of this equipment, especially when we can also customize that experience with the ‘Dolby Atmos Sound System’ application. 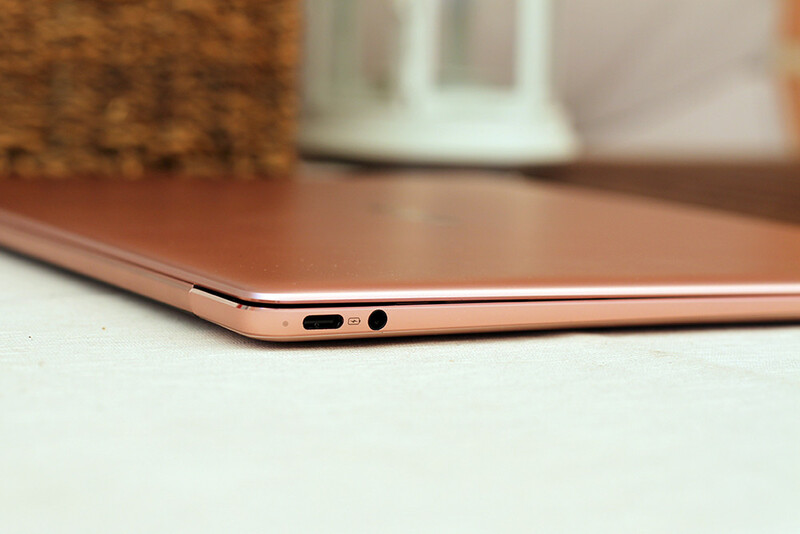 The quality of the sound is very good (with the limitations imposed by this design) but what is really remarkable is the volume that can reach this laptop : I do not remember a similar sound power in other laptops both ultra-thin and conventional. As we had already anticipated, the keyboard is equally outstanding, and here is inevitable comparison with the MacBook that even having improved in this section in its latest generation, have a keyboard that at least personally not convince me with that new mechanism improved “butterfly”. 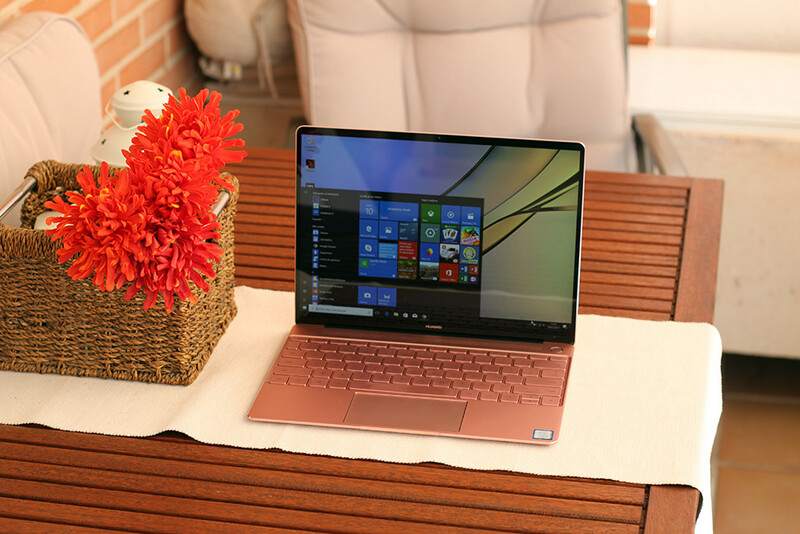 The travel and touch of the keys is almost what one could expect from a much thicker laptop, and it is appreciated that Huawei has opted for this type of configuration. The touchpad also behaved without problems and the support of the tactile gestures of Windows 10 is complete. In our test team, yes, the keyboard layout was American, but it was not too hard to get used to it, especially if we consider that the answer, size and layout of those keys was very correct. Special mention here for the fingerprint sensor located above the power button. In our tests with other computers with Windows technology Hello webcams with facial or iris recognition seemed to us the best option for portable computers, but the fact is that the fingerprint sensor has behaved in such an exceptional way that it is difficult to consider which option is best. One would think that the tactile sensor is more natural in smartphones, where the gesture of putting the finger on that sensor is almost involuntary. Something similar happens with the webcams in laptops since we use these products “looking at them from the front”. However the footprint sensor in the MateBook X behaves fantastically and we believe that confirms that biometrics help make working sessions even more comfortable, especially if we have to leave and enter the work session often. Choosing Windows 10 Home as a pre-installed operating system is consistent with the guidance of this computer, and as expected would not get rid of some bloatware. We give games like ‘Fallout Shelter’. 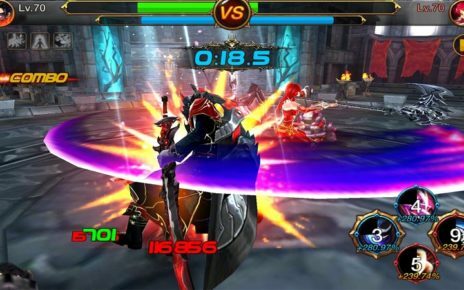 ‘Candy Crush Soda Saga’, ‘March of Empires: War of Lords’ or ‘Asphalt 8’ await us after the first start, but they do so with some more interesting surprise such as the said application of audio profiles or the so-called ‘MateBook Manager’, which allows to manage the state of the equipment (remembering a little the role that these applications play on mobile) and the downloads of new drivers, for example. Almost everything seems a success in the MateBook X, but there is a section where we will have to make a sacrifice to enjoy it, and that is the battery autonomy. In our tests with continuous use we have verified that this autonomy is around 6 hours, maybe 7 if we are careful. 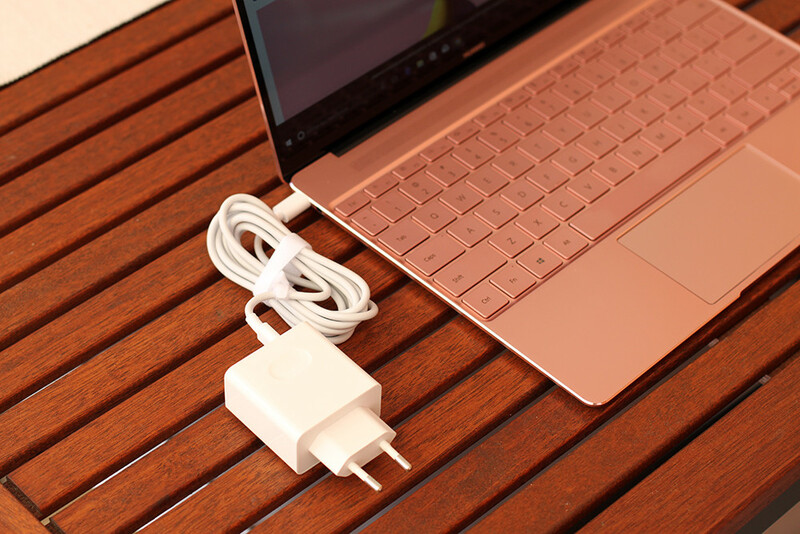 This limitation is somewhat offset by the fact that the MateBook X supports fast charging and in addition the charger / power adapter seems more like a mobile than a laptop: it is surprisingly small, one of the most compact we have seen on the market, definitely. Here the thickness logically limits the possibilities, but in intensive uses it is necessary to take into account that that duration of the battery will be reduced still more. Watch out for that parameter if you are thinking of buying a computer like this. Solid State Batteries: What are they and what advantages do they have over lithium?